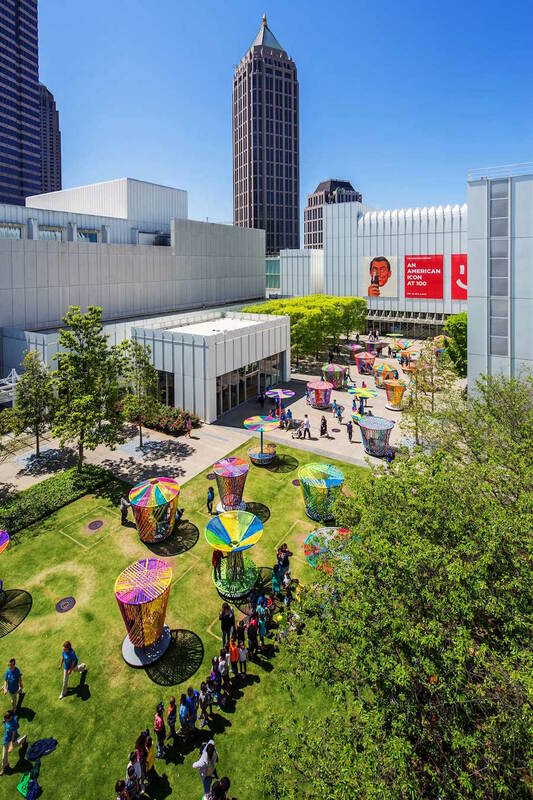 The don’t-touch, hushed ambiance of museum corridors often raises the problem of flagging visitor engagement for museum directors. 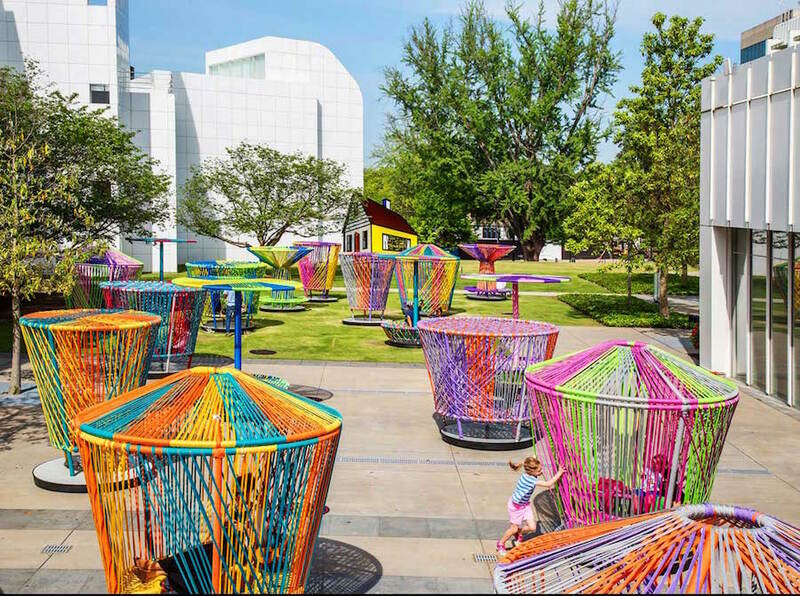 The High Museum of Art in Atlanta sought to restore vibrancy to its campus, part of the Woodruff Arts Center, with a series of violently colorful 3D structures inspired by spinning tops. 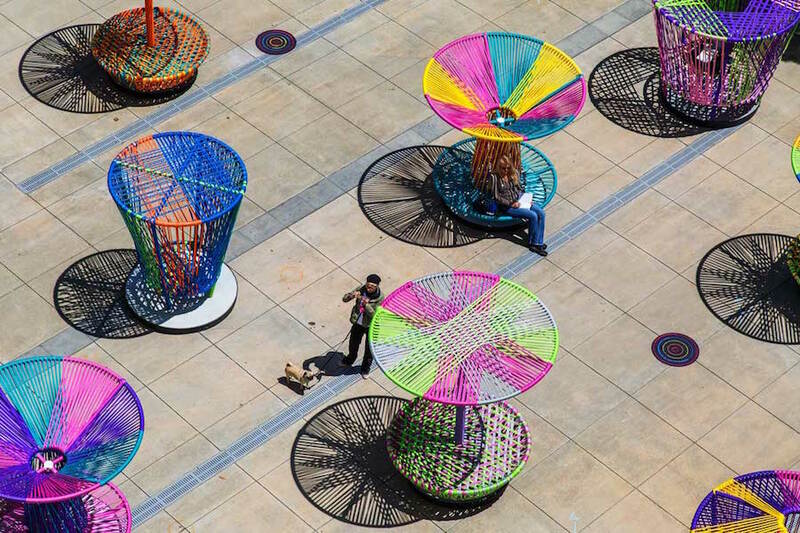 Dreamed up by Mexican designers Héctor Esrawe and Ignacio Cadena, Los Trompos—Spanish for “spinning tops”—is the first thing visitors glimpse upon entering the campus of the Woodruff Arts Center. 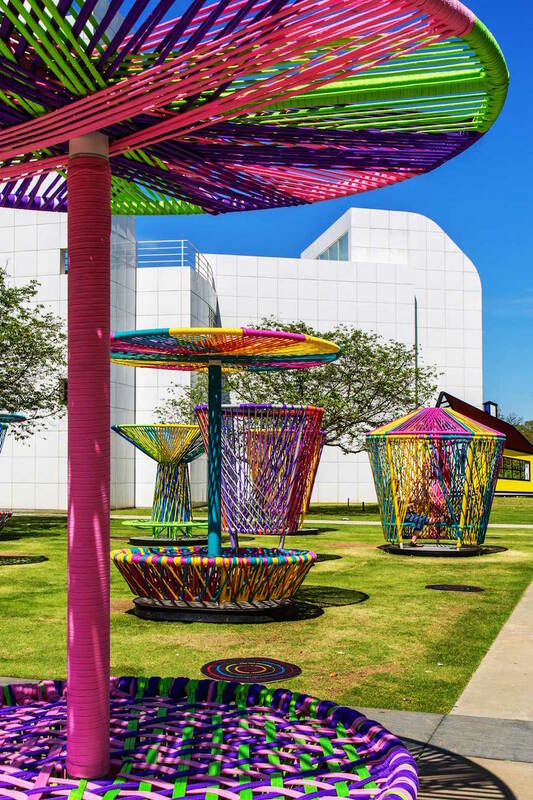 Similar to a playground merry-go-round, each spinning top can revolve on its base provided that two or more people are pushing it—thus necessitating interaction among visitors. “Only through this interaction and collaboration will the work come to life and be complete,” said Cadena. 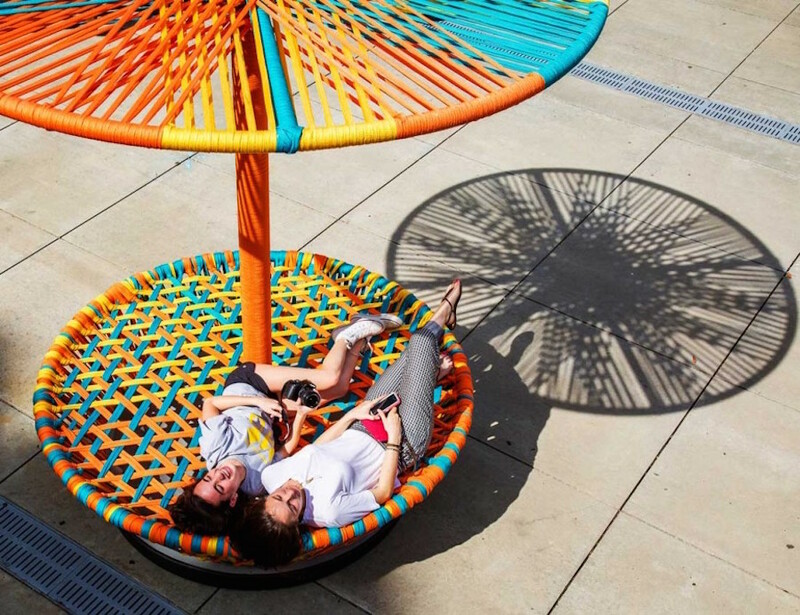 More than 30 of these 3D tops dot the Carroll Slater Sifly Piazza, each one made from flat nylon rope woven in traditional Mexican style. 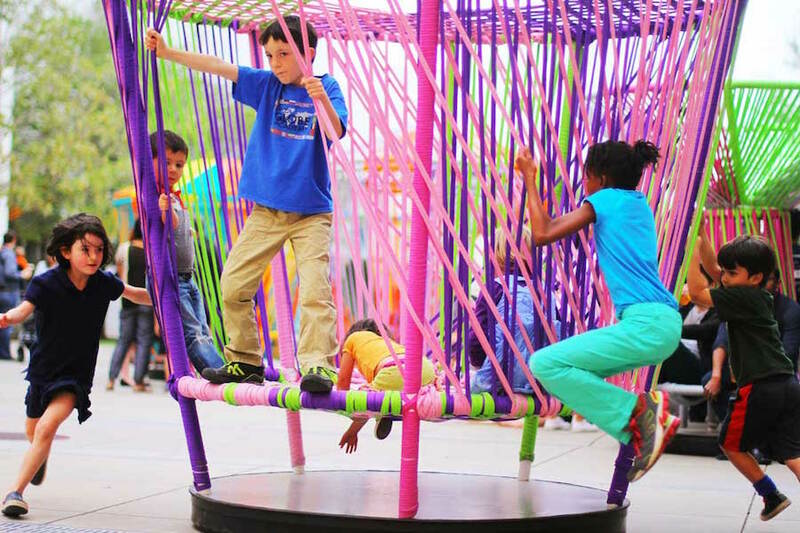 The installation will be a linchpin in attracting visitors to the outdoor community programs, performances, and art-making activities planned as part of a multi-year Piazza activation project, recently extended to 2017 by virtue of a grant from the Lettie Pate Evans Foundation. Los Trompos, on view through November 29, builds on the success of 2014’s Mi Casa, Your Casa, under the auspices of this same project, in which Cadena and Esrawe peppered the Piazza with metal-frame houses with hammocks. Through a partnership with the Midtown Alliance, Esrawe and Cadena will bring their spinning tops to seven more Midtown sites in Georgia.